We have come to our last Sunday of the Lenten Season. Next Sunday we will commemorate our Lord’s entry into the city of Jerusalem, that is Palm Sunday. Today’s scripture readings prepare us for what we are about to celebrate. We hear in today’s gospel passage that the hour has come for the Son of Man to be glorified. As we prepare to enter into these most holy days, we must truly conform ourselves to the heart of Christ, so that we can enjoy and bask in the glory of Easter. Jesus reminds us today that he will draw all things to himself. Jesus will draw creation to himself, all for the glory of God our Heavenly Father. This is why the Lord was sent to this world, to draw us unto himself, for our salvation. As I mentioned in my homily last weekend, Jesus is the gift that the Father has given to us. We must continue to thank and praise God each and every single day of our lives for the great gift of Jesus Christ, our Savior and King. May our love for the Lord transform this world in darkness as we prepare to enter into the sacred mystery of our faith, that is the Lord’s Passion, Death, and Resurrection. Each Friday during the season of Lent, we have prayed the stations of the cross at each of the three churches. This Friday, March 23, we will all come together for stations of the cross as one at Our Lady of Victory Church at 7:00PM. There will not be stations of the cross at St. Peter Claver or Holy Rosary. We will welcome Father Willy Kingsley as the homilist for our communal stations this Friday night. Father Willy was assigned here to St. Martin dePorres as a transitional deacon and now is the Parochial Vicar at St. Peter and Paul/St. Agnes Parish in Brooklyn. This Tuesday will be our last Tuesday evening Eucharistic Adoration and Vespers. It will be held at Holy Rosary Church beginning at 7:00PM. We will welcome Father Rafael Perez, the Parochial Vicar of Divine Mercy Parish in Williamsburg. The Holy Week schedule are available at each of the three churches. You will find beautiful prayer cards with the schedule for Holy Week on the back of them. Please take home a few for family and friends. Remember to invite people to our churches this Holy Week and Easter! On Monday of Holy Week, we will have Reconciliation Monday. 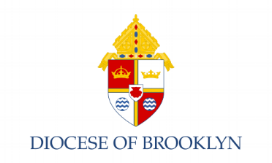 In every single Catholic Church in the Dioceses of Brooklyn, Rockville Centre and the Archdiocese of New York, there will be a priest available for Confession. It is a beautiful way to begin the Easter season, by acknowledging the sins that we have committed and asking for God’s forgiveness and mercy through the sacrament. Next Sunday is Palm Sunday, which is the beginning of Holy Week. Next Saturday, March 24, we will have our Passion Play that will take place at St. Peter Claver Church beginning at 8:00PM. Next Sunday the procession for Mass will begin outdoors at each of the three churches. We adore you O Christ and we praise you, for by your holy cross you have redeemed the world.